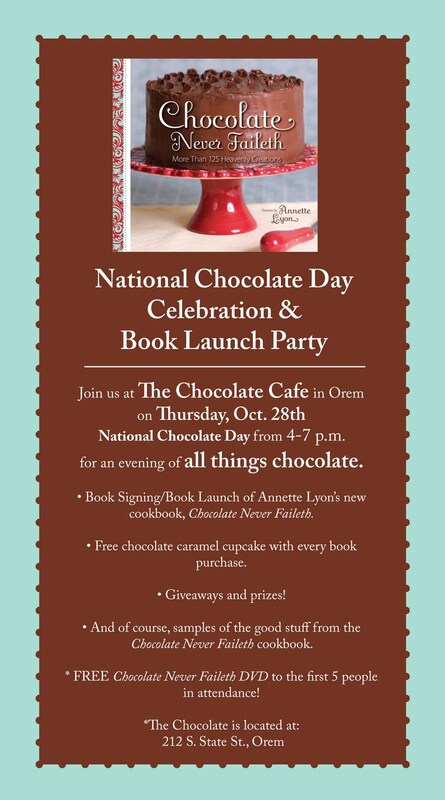 I interrupt my regular blogging schedule to announce what I will be doing on Thursday, October 28th (a week from today) on National Chocolate Day. I hope you'll celebrate with me at my cookbook launch party! It's at THE CHOCOLATE dessert cafe in Orem (can I hear a woot, woot?)! Check out the deets on the invite below. Spread the word! If I lived anywhere in Utah, I'd be there! Yay! So glad you were able to connect with them. If I weren't doing a Sassy review that night, I would be there. Congrats on your launch party! :) Wish I could come and meet you! Wait...isn't Tuesday the 26th? Just so I can see if I can be there, which date will it be? The 26th or the 28th? Congrats that is awesome. Good luck I wish I could make it. Congratulations! That is very exciting and so very awesome that you can have your launch at The Chocolate! Is it just me or are others having problems viewing the content on your page? The videos don't play, the audio is there but the video is all green. Also the invitation image doesn't load either. It doesn't matter if I pull it up in Firefox or MS Explorer. Odd, Steph. I hope it works for others. I use Chrome, and it all works for me. Hmm. Congrats on the debut of your new book (and what a perfect location for the launch party! ).